Banking sector has been one of the strongest pillars of Indian economy. The recent boom and its growing dominance have made Banking job a very lucrative career option. Banking Jobs offer excellent benefits like excellent pay, medical protection, holidays, job security, work-life balance and timely career growth and progression, which makes it one of the most sought after employment opportunities in the market today. Among the many benefits offered by banking career, retirement benefits have also been one of the reasons which have tilted the scales in the favour of Bank Jobs, motivating more and more number of government job aspirants to take up bank recruitment exams. When other employers, be it in public sector or private; are busy cutting down the retirement benefits to their employees; Public Sector Banks like SBI continue to support and expand the purview of their retirement benefits to cover both Pension and Gratuity under it. Provident Fund is one of the main retirement benefits / contributory funds offered to Bank employees on retirement. Any PSU Bank Employee who retires / resigns after service period of 5 years or more is eligible to receive the balance (Member’s Contribution + Bank’s Contributions) at his credit in the fund. Generally, the amount of personal and bank contribution as well interest rate and tax component on PF varies from time to time. √ Superannuation Pension: As evident from the title, this pension is offered to PSU bank employees after attaining the age of superannuation. The minimum service years required to qualify for Superannuation Pension are 10 years, while the maximum service period covered under it stands at 33 years. √ Pension on Voluntary Retirement: This pension is applicable for employees that take up voluntary retirement from bank. The minimum service period required to qualify for VRS pension scheme is 20 years. In order to be eligible for voluntary retirement pension, employees has to give notice of not less than three months in writing to the appointing authority; seeking voluntary retirement. √ Invalid Pension: Invalid Pension of offered to PSU bank employees who retire from service on account of bodily or mental infirmity, which permanently incapacitates him from the service. The minimum service years eligibility to claim invalid pension is 10 years. Along with this, the employee also has to submit medical certificate of incapacitation issued by Medical Officer approved by the bank. √ Compassionate Allowance: Compassionate allowance is offered to bank employees that have been dismissed or removed or terminated from service. Such employees will have to forfeit their pension amount completely. However, under special circumstances, the higher authorities can grant a compassionate allowance not exceeding two third of the Pension, depending upon the qualifying service rendered up to the date of dismissal. √ Premature Retirement Pension: Applicable to those public sector bank employees who have retired on bank orders prematurely in public interest or other similar service regulations. The grant of premature retirement pension is only done to employees who would have entitled to such pension on superannuation on the date of retirement. √ Compulsory Retirement Pension: Any PSU bank employee who had to retire from service as a penalty in terms of service regulations is eligible for Pension at a rate not less than 2/3 and not more than full Pension admissible to him on the date of his compulsory retirement. If the Bank employee dies after 7 years of service with the bank, the family is entitled to pension amount equal to 50% of pay last drawn by the deceased employee or twice the ordinary rate of family pension whichever is less. In case, the retired PSU Bank employee passes away before 65 years of age, the same amount is applicable for family pension rate. √ Maximum Pension: Similarly, PSU bank employees who retire after service of 33 years will be entitled to 50% of their average emoluments as Basic Pension. In case, the number of qualifying service years is below 33 years, the basic pension would be proportionate to their service. 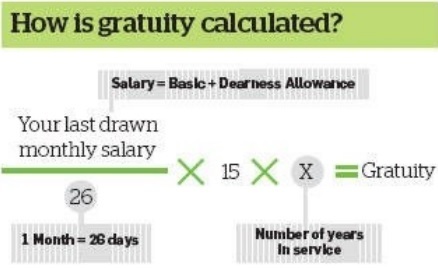 Under the Payment of Gratuity Act, 1972, all employees who have put in minimum 5 years service are eligible for payment of gratuity. The amount of gratuity payable to PSU bank employee is calculated at 15 days wages for each completed year of service on the basis of 26 working days in a month, subject to a ceiling of Rs. 10.00 lac w.e.f. 24.05.2010. √ Medical Benefits: Many public sector banks like SBI continue to offer medical benefits to their retired employees. Under such schemes, retired PSU Bank employees can continue to reimburse their medical expenses. Although medical benefits policy is different from one bank to another, but generally these are only offered to employees retiring on superannuation at the age of 60 years. √ Leave Encashment: PSU Bank employees retiring are eligible for encashment of Privilege Leave upto maximum of 240 days. The leave encashment would be free from income tax upto Rs 3 lakhs. √ Travel Expense Reimbursement: For those bank employees who are posted outside their hometown, PSU banks offer travel expense reimbursement for travel to home-town. √ Mobile Handset: Retired PSU Bank employees who have been allotted official mobile phone can retain their handsets without any additional cost if they 1 year or older. √ Laptop: Retired PSU Bank employees who have been allotted official laptops can retain them without any additional cost if they are 1 year or older. √ Concessionary Interest Rate Benefit: Retired PSU bank employees continue to enjoy Concessionary Interest Rate Benefit on deposit and advances against specified securities, as applicable to staff members. √ Holiday Homes: PSU Bank employees can avail benefit of holiday homes, bank guest house, transit home and visiting officers flat even after retirement. Some of these are liable to change from one bank to another and can also be modified as per the new bank policies. These are just few of the retirement benefits available to PSU Bank employees currently. Today, when all other employers are busy reducing their financial burden by significantly cutting down on retirement benefits offered to their employees, banking sector has continued to swell their retirement benefits policy to help their employees. This is also one of the main reasons for banking sector attracting the best talents from all academic backgrounds.